Savings can be as much as 90% for Americans seeking medical care abroad, reports the Medical Tourism Association. It was once associated with shady doctors and unsafe conditions, but medical tourism has become a booming multi-billion dollar industry. And more Americans are travelling abroad than ever for cut-price health care, in a bid to avert the astronomical costs of undergoing treatment at home. From a nip-and-tuck to dental work or a heart bypass, hospitals around the world treat millions of foreign patients a year - and most of them fly in from the U.S., experts say. A recent report from Reuters showed than Americans can typically expect to save 40-50 percent depending on the procedure. However, in some cases, the savings could be much more. According to the Medical Tourism Association, savings could be as much as 90 percent. The cost of a heart bypass in the U.S., averages $144,000, according to the MTA, compared to a cut-price $14,802 in Colombia, or an astounding $5,200 in India; while a patient seeking a less-invasive procedure, such as Lasik, can pay as little as $500 in India for both eyes, compared to over $4,000 stateside. For those seeking a nip-tuck, the prices show similar shocking variance. 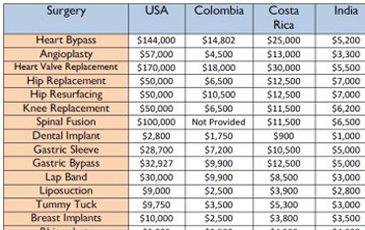 Liposuction, averaging $9,000 in the U.S., is cut to $2,500 in Colombia and $3,900 in Costa Rica, and American patients can save as much as $11,000 on a face lift in a foreign country. Lured by more affordable medical care and modern facilities, places like Malaysia, India and Turkey, have also become hot-spots for patients seeking procedures abroad, according to experts. Medscape News web site has forecast medical tourism in Asia could generate $4.4billion by 2012. According to the Korea Health Industry Development Institute, the number of tourists coming to South Korea ballooned last year to nearly 82,000, generating about $700million in revenues. By next year, Singapore aims to treat a million foreign patients a year, generating about $3billion for the economy, the Singapore Straits Times has reported; while neighboring Malaysia, attracted nearly 400,000 medical tourists last year, and aims to increase that number to 1.9million by 2020. The Philippines also sees itself as a cut-price destination, and is projecting the number of medical tourists to hit one million by 2015, generating at least $1billion in revenue. Dr Glen Stream, president of the American Academy of Family Physicians, explained that many of the patients are middle-class workers who simply can't afford medical care at home. Experts say many other factors, including the wobbling U.S. economy, are contributing to the rise in the globalization of health care. Many countries are seeing a massive investment in the health care sector and improved medical standards in countries in South and Central America and Asia. More than 400 organizations in 39 countries over the last ten years have been accredited by the Joint Commission International, which is affiliated with the same body that accredits U.S. hospitals. And many foreign doctors now receive their training in the U.S.
A statement from the Medical Tourism Association's website reads: 'These hospitals are being built to keep local patients from traveling abroad for healthcare and to also to attract foreign patients across borders. If the industry achieved even a fraction of its projected growth 'this could ultimately lead to locals being priced out of their own health care system, as demand from foreign patients can drive up the costs of providing care for everyone', it said. The World Health Organization said in a report late last year that rapid development of medical tourism had presented 'considerable implications for public health'. It said that with the influx of foreign patients, the demand for and price of healthcare might rise. 'In addition, an increasing number of health services might cater for the needs of foreign patients and neglect local needs', it said.